Supply chains and the solutions used for managing them have become increasingly important as businesses become more global and interconnected. This is why it’s critical to identify, understand, and measure how labeling has a strategic impact on your supply chain and your company’s business growth. Approximately 65% of those surveyed claim that they recognize the necessity of having labeling addressed on a global scale. More than half of those work for companies that maintain labeling across a global operation, with five or more locations. Therefore, labeling, which intersects the supply chain at all levels, has become mission critical in meeting evolving customer requirements, keeping up with emerging regulations, and avoiding disruptions from the manufacturing line to the warehouse. At the same time, as companies are looking at labeling on a global basis they must consider how to effectively deploy and maintain their labeling solutions, how to support enterprise wide labeling changes and how to scale effectively as their businesses continue to grow and enter new markets. The barcode label is simply not what it used to be. Companies that understand this will find themselves ahead of their competitors in meeting evolving customer demands. As customer and regulatory requirements increase, companies have been forced to make a record number of label changes and add more and more content to their labels. Over 80% of respondents reported that labeling requirements have become more complex in the last three years. To meet these increasing demands, labels today must be flexible and data driven to support the nearly limitless variability in requirements that exist. 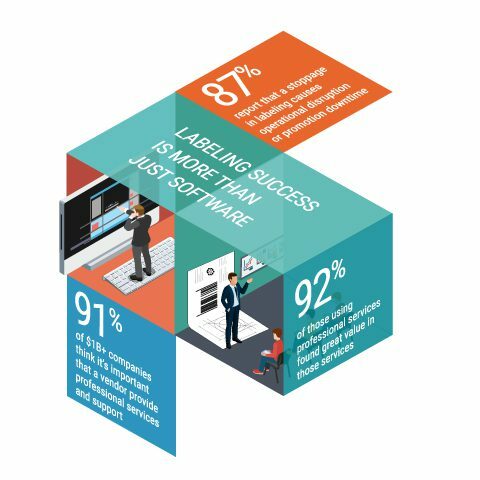 In many cases, the key is enabling business users with a simple mechanism to make label changes as well as integrating with enterprise applications to automate labeling processes. This increases efficiency, leverages existing investments, and reduces the need for countless permutations of label templates. As the complexity of a global supply chain increases, so too does the need to track goods and products that travel through it. Gartner indicates “Digital innovation will lead to a new approach to the supply chain.” They further claim stating, “The divide between what the supply chain provides and what the enterprise needs is widening. Closing that gap requires a new, agile approach to investment in technology, leadership and talent.”  More than 63% of respondents report that they are currently combining digital technology with traditional practices to improve supply chain operations. This intersection between physical and digital worlds within a supply chain is intended to “renovate legacy environments into a state that is fit for a digital world.” This approach allows manufacturers to gain “the best of both worlds” by embracing digital technology and new business models while continuing to use reliable physical processes that have worked well in the past. 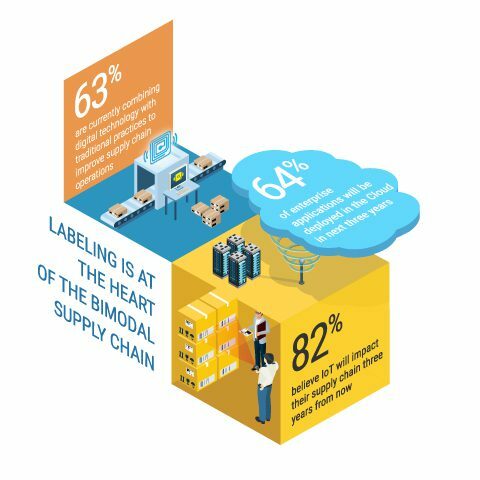 Labeling plays a key role in representing the bimodal supply chain considering the label is a physical representation of digital information, which is often encoded in a barcode. Businesses today are relying on seasoned labeling professionals for best practices, implementation consulting, training, and knowledge transfer to help ensure success. They understand that working with these experts can help minimize or eliminate production stoppages, optimize supply chain operations, improve customer satisfaction and ultimately increase business. These professionals are able to help them deal with the many unique labeling requirements to address dynamics of different industries, products, geographies, regulations, business models. More than 92% of respondents using professional services found great value in those services. With this focus, expectations have increased for labeling professionals to understand and provide guidance on evolving industry standards and regulations, business processes, and regional nuances, along with expert around-the-clock support to enable continuous operations. Loftware conducts an annual survey to get a pulse on the impact of labeling on today’s supply chain. 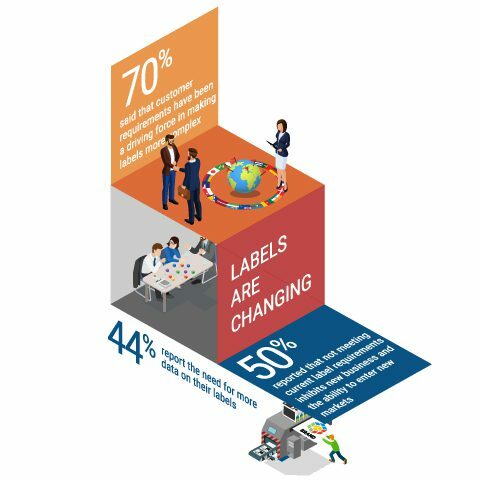 We polled over 800 supply chain and IT professionals from organizations across all major industries in 32 different countries to gather insights on what they saw as the major trends in Enterprise Labeling for 2017. 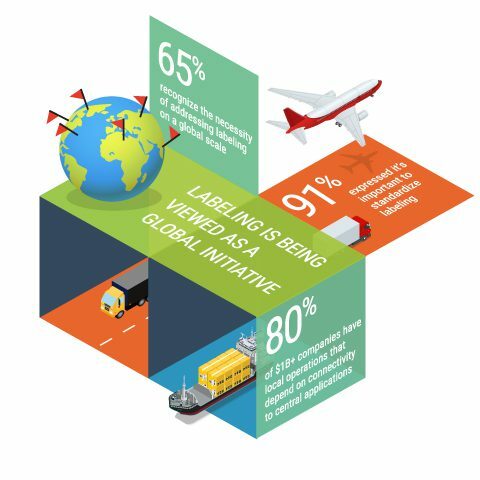 Our fourth annual “Top 5 Trends in Enterprise Labeling” report outlines significant shifts in labeling that are impacting global supply chains at an unprecedented level.